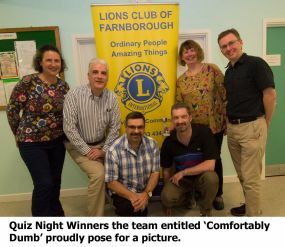 Farnborough Lions held their second quiz night of 2018 in Mid October when 23 teams took part in a fun evening. Question topics varied between General Knowledge, Tom Hanks Films, Olympic Games, Dads Army, Russia and the 4th of July. 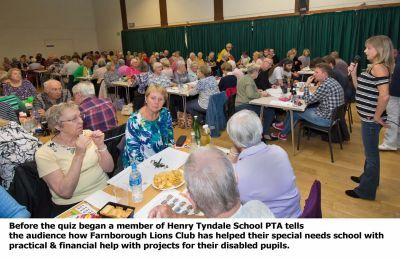 As the Lions hold these twice yearly quiz nights to raise funds to be used in the community, the evening started with a member of the Henry Tyndale School PTA telling the participants how Farnborough Lions have supported this special needs school with practical help and financial assistance over many years on a number of projects which help their disabled pupils. At half time the record breaking raffle was drawn with many good quality prizes being won by the worthy quiz night participants. 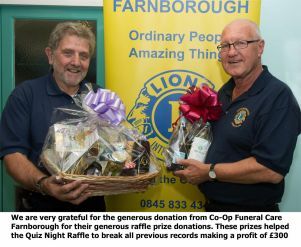 Lion President Ray Bentley said "we are particularly grateful to Co-Op Funeral Care, Farnborough who donated some wonderful prizes. 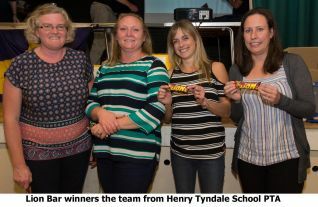 This helped the autumn 2018 quiz night raffle break all records by making a magnificent £300 profit". At the end of a very enjoyable evening the quiz night totals were totted up with the team entitled 'Comfortably Dumb' winning by a clear margin, the Vikings came second and Cove & Farnborough WI came a close third. For a full rundown of the scores and placing's click on the final scores icon on the right. The whole evening made an outstanding total of £840 profit which Farnborough Lions will use to help good community causes in the local area. We would like to thank all the quiz night participants for their generous support. A date for your diary.... the next Farnborough Lions Quiz Night is on Saturday 16th March 2019.